Control your robotic arm remotelly using an ESP8266 WiFi module, from a simple html interface! Robotic arms kits are getting cheaper and cheaper. You can find different models online and try different methods to control them. This project is part of a series of tutorials in which I explore different methods for controlling a robotic arm. There are several ways you can use this tutorial. If you don't have a robotic arm kit (and doesn't want to buy or build one) you can still use it to learn something about Arduino programming, and how to interface an Arduino with an ESP8266 module on your own projects. You can also use it to practice your electronics and mechanic skills. You might find other robotic arm kits online (link), or even design your own. There are some awesome projects you can 3D print, for instance. In the next step I'll show you how to assemble the arm kit before wiring up the circuits. If you doesn't have a similar kit, feel free to jump some steps. You can use another robotic arm kit, assemble it and jump directly to the electronics and programming steps. In this step I'll show you how to assemble the arm kit (mechanical parts) I've used (link). If you doesn't have a similar kit, feel free to jump some steps. You can use another robotic arm kit, assemble it and jump directly to the electronics and programming steps. The first servomotor is mounted perpendicular to the base, using a servo bracket. This profile is attached to the base using four M3 bolts and nuts, as it's shown in the pictures. Servo #1 is place on it's top, and attached using four M3 bolts and nuts. A circular metal horn is attached to the servo axis. The kit comes with several plastic horns. They won't be used for assembling the robot. Another servo bracket is mounted perpendicular to the previous one. It's connected to servo #1 horn using four M3 bolts. Servo #2 is installed with four M3 bolts and nuts, and also uses a circular metal horn. An U bracket is then attached to the horn using four bolts. Notice that a M3 bolt is used oposite the servo axis. It gives stability to the structure. A bearing fits on this bolt, and it's locked in position using another M3 nut. This way the U bracket is tightly attached to servo #2 center axis. Another U bracket is mounted using four M3 bolts and nuts. On the other end, servo #3 is installed, using a circular metal horn and four bolts. A servo bracket is connected to the servo motor, and a L shaped profile is linked to the servo bracket using some bolts and nuts. Notice that another bearing is used oposite to the servo axis, as described before. Another U bracket is connected to the L shaped profile using a set of four M3 bolts and nuts. Similarly to the previous step, servo #4 is mounter to the U bracket using four bolts. Another servo bracket is connected to the servo. The fifth servo is connected perpendicular to servo #4 using another servo bracket, installed using four M3 bolts and nut. The gripper is then connected to servo #5 axis. On it's top, servo #6 is connected using some bolts, nuts and a metal horn. The gripper has some gears, which will turn the rotation of the servo into a linear movement of the gripper. Once the structure is assembled, you'll be ready to wire up the circuits. I used the controll board shield that came along with my robotic arm kit. It makes the connection of the components easier, since it already comes with specific connectors for the servomotors, power supply, etc. Unfortunatelly this controll board doesn't have a specific connector for the ESP8266. So I had to use some jumper wires to connect that Wi-Fi module to my Arduino Mega. You'll notice that the servo control shield has two pins labeled as 5V. Although, one of then is actually a 3.3V pin. Test it with a voltage meter. You'll also need to connect an external 12V power supply. I suggest one with more than 2A output. The servos consume a lot of power, and if the power supply is not powerfull enough, the servos will vibrate and get really hot. They will also lose their strenght. Don't connect the power source until you've uploaded the Arduino code (shown in later steps). There's a power button on the shield. Keep it on the off position. Plug an USB cable on the Arduino and proceed to the next step. Warning! You'll notice I've connected my ESP8266 RX/TX pins directly to the Arduino TX/RX pins. It worked for me, but I don't recommend doing the same. ESP8266 works with 3.3V, and the Arduino pins run on 5V. Some say it might burn your ESP8266 module (although I've tested it several times, and had no issue). You might use a voltage divider or a voltage level shifter if you want to convert 5V to 3.3V. Now that the hardware is ready, it's time to work on the Arduino code. 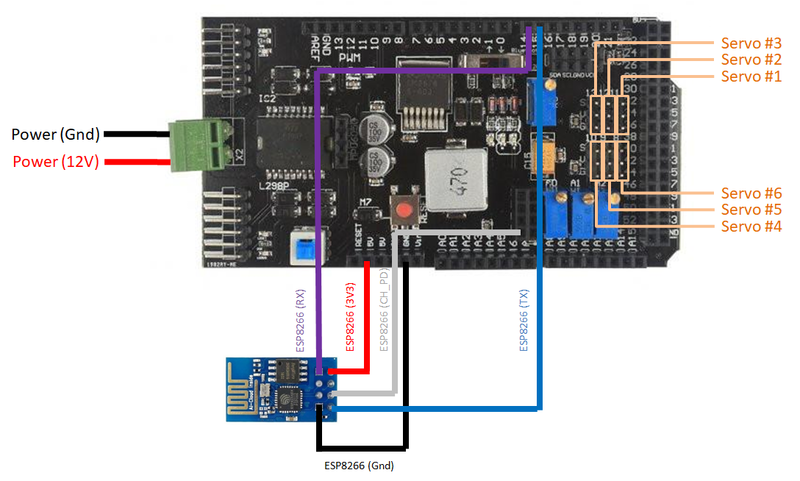 No additional library was used for the communication between the Arduino and the with ESP8266 module. Please check the baudrate of you ESP8266 and set it properly in the code. Download Arduino code (browser-controlled-arm-v3.ino) and replace the XXXXX by your wifi router SSID and YYYYY by router password. Connect the Arduino board to your computer USB port and upload the code. Once the circuit is powered, the arm will move to the starting position, and the ESP8266 will try to connect the Wi-Fi network. Warning: when the code starts running, the robotic arm will move really fast to it's initial position. Be careful not to get hurt or damage nearby equipment during startup! You'll possibly have to replace the starting angle of each servomotor depending on how your servos where mounted. Before the setup, the code imports the libraries used on the sketch. Only servo.h library was used. No library was used for interfacing with the WiFi module. Pins to be used are defined, and global variables are declared. angle# integer variables store the initial position for each servo. If you want your robot to start at a different position, change the values on those variables. angle#sp are the set points for each servo. During the execution of the code, the controller will move the motors at a given speed until they reach the setpoints. servo_speed variable define the speed of the movements for all the servos. If you want a specific servo to move faster, increase its value. //it will try to move instantaniously to that position when powered up! During the setup, each servo is attached to an especific pin, and its position is started. Two serial ports of the Arduino Mega are used: one for the Serial Monitor communication and other for the communication with the ESP8266-01 module. Both serial communications are started during the setup. The communication with the ESP8266 module uses standard AT commands. First the Arduino sends a command for the rest of the module (using AT+RST). It will restart the module. ESP8266 module might work in station or as a access point. It's set to station mode (using AT+CWMODE=1), and receives a command for the connection to the WiFi router (AT+CWJAP=SSID,PASSWORD). A while loop waits until the connection is successful. AT+CIFSR command I used to display the IP address attributed to the ESP8266. It will later be used on the control interface. A webserver is then started at port 80. This way the ESP8266 will be able to receive messages addressed to that IP address and port. The main loop is repeated over and over. During each scan, the Arduino will check if there's an incoming message. If it does, it will read the full string and break it into six smaller strings. Each one will represent the setpoint for each servo. The code will increase/decrease the angle of each servo in small steps until it matches received setpoint. In the end of each cycle a delay is used to limit the speed of the motors. In order to send commands to the Arduino, user shall enter the IP address assigned to the ESP8266. As it was described before, you can get it using the Serial monitor. Fortunatelly, the IP tends to be repeated itself in the following connections. On this controll interface, the user can select a given angle for each joint using some sliding bars. Current angle for each servo is shown under each bar. An Add position to command stack button aloows the user to store current position of the arm on a Command stack in a text box. This way, a sequence of position can be stored, with a configurable delay between each movement. Each command is define as sr1:angle1 sr2:angle2 sr3:angle3 sr4:angle4 sr5:angle5 sr6:angle6 delay:time. Angles are represented in degrees and time in miliseconds. User can also edit the commands manually on the text box. Run command stack plays the sequence of commands stored on the command stack. Clear command stack erases the list of commands. User may also save the command list (in a text file) and load it later. This way, one may store sequences of commands and repeat them. The body is where all the inputs (text forms, buttons, and sliding bars) are defined. A text box was declared for the user to enter the IP address to each the commands will be sent. It's started with a given IP address (192.168.0.9), but you have to update it with the IP address obtained from the Serial Monitor. Six sliding bar were added in a six column table, one for each servo. Sliding bars are defined using a range type input, with angles between 0 an 180 degrees. Value parameter gives the starting angle for each servo, which is show at a text field bellow each bar. The user can change the angles by dragging the slider with the mouse. When mouse button is released moveSrs() function is called. It will be descibed later. A button was defined for adding current angles to the command stack. addCommand() function is called when it's clicked. A textbox on its right is used for the user to enter a time delay (in milliseconds) to be used between two commands. A second table was used to organize other features. A textarea was defined to store the commands stack. Bellow it there are two buttons, which are used to call runCommands() and clearCommads() functions. By the end of the table there are some buttons for saving and opening text files. As it was described before, whenever on of the sliders is moved (and released),moveSrs() function is called. It has as inputs the angle of each servo. It processes those values (add some zeros, so that it always have three digits) and send a message to the IP address of the ESP8266 module. There's one updateTextInput#() function for each servo. It's used only for updating the text under the sliding bar with servos' current angles. addCommand() function simply add a new line to the stack textbox with appropriate angles and delays. clearCommand(), in other hand, clears that textbox. runCommands() is where the command stack is processed. It reads on line at a time and split it to get the angle of each servo in that command line. I'll notice a setTimout function was used. A time variable 'k' is incremented at each command line by given time (delay value). Using setTimout function, a new command is only sent after a given time was passed, and the ESP8266 won't receive a lot of messagens at the same time. Otherwise, it would have its buffer exceeded and might crash. Plug the USB cable on your computer, open the serial monitor and power up the robot. It will automatically connect your WiFi network and show it's IP address. Save that number. You may now remove the USB cable (and even reset the Arduino). It will probably use the same IP address if you try to connect it again to the same network. Open the interface on your web browser, and enter the IP address you've seen before. The computer have to be connected to the same WiFi network. Select the angle for each joint and add to a stack of commands. A delay might be used between any two commands. Notice that the delay have to be large enough to ensure the previous command has ended (the robot has reached last set point) before a new command is sent. You can save the stack of commands on a .txt file and use it later. Save some moves, play them and have fun! Electrical and Mechanical engineer, master in automation and control. specialist in industrial instrumentation. Mad scientist and inventor.